Meet Up With Ann At DOAG 2015 | Oracle Standard Edition – Just love it! Hopefully I meet You there. I will be speaking at DOAG 2015 in less than two weeks! This is my first time as both a speaker and a visitor, and I am looking forward to this event. 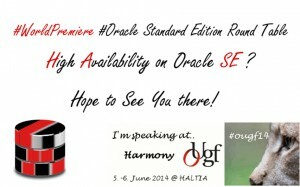 I enjoy the opportunity to meet new people and old friends, and I would love to meet up with you personally to exchange thoughts about Oracle Database Standard Edition; or any other topic that might be on your mind. Just grab my arm if you feel for making the acquaintance. 08:00 am – 08:45 am Standard Edition Database  something for the Enterprise? 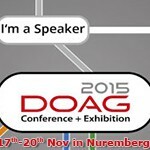 So between November 17-19 – I look forward to meeting you in Nuremberg, Germany at DOAG 2015 Conference+Exhibition! Take care, stay well, and enjoy this lovely autumn. We have an exceptional 10 degrees Celsius here in Finland. Looking forward to meeting you there! We need to wash down the sorrow of SE2 replacing its younger brethen.